Autodesk has just recently posted the Service Pack for AutoCAD 2005 and AutoCAD LT 2005. The Service Packs come after the products were released some 6 months ago. You can find out more on Shaan Hurley's blog Between the Lines. There seems to have been work completed on both new and legacy bugs in this Service Pack. Shaan also has a summary of some of the fixes that were made on his blog. I'm not a large fan of concerts, but when I found out Metallica was coming to Milwaukee this year I decided to go. The show opened with the group Godsmack and by the time they were done with their set I am surprised the building was left standing, as they gave the audience a show to remember. After an intermission break, Metallica appeared on the scene to pick-up right where Godsmack left off and they gave the crowd what they had waited for... one heck of a show with songs that spanned the bands great career. Along with the songs listed above... the each artist performed an instrumental solo, which was down right awesome. Discreet, a division of Autodesk, is getting close to shipping the next version of 3ds max. I have also heard of reports the subscription pricing is going up with in the next week and this came from my reseller. Along with the hike in the subscription price potentially they upgrade path for users that are still on version 3 of 3ds max will be ending once the upgrade ships. There is a promotion out there for users that are on versions 3, 4 and 5 yet to upgrade and get 25% off plus get on subscription. "For a limited time, purchase a new copy of 3ds max 6 OR upgrade from versions 3**, 4 and 5 with subscription and save up to 25%. Click here to learn more about 3ds max 7. The latest issue of AUGI's HotNews has just been released. As always there is a great variety of information that can be found in each issue. Some of this months articles at a glimpse is the TIPniques article called "AutoCAD In Drag" and the Customization Corner article called "Tool Palettes Part 3 — Importing & Exporting". There are many other great articles that cover License Borrowing with Autodesk products and AUGI's AUGI Training Program (ATP) course offerings for September. My blog has it's ups and downs based on my work load at times. I have received many great comments and e-mails in regards to the content found here and other places that I contribute. Thanks to those that have visited my web log and helped to reach the 10,000 milestone since it was first introduced. This blog was originally set up to help spread information to as many AutoCAD users as possible and I think it is doing a pretty good job, not excellent yet, but time will tell though. Happy CAD-ding to all. If you are attending Autodesk University (AU) for your first time or not you will want to be part of the Top Daug competition. It is a two part contest that determines how well you know the application and then how well you can draw up a small drawing. I have been privileged enough to participate in the contest over the last two years and rank in the top 10 both times. As far as winning the thing I have come closer each year, but my drawing skills are not what they once were, but if the drawing could be coded I would be right there. Picture of last years finalists... usually not everyone checks the final list of who made the cut, as you can see there isn't 10 in the picture. 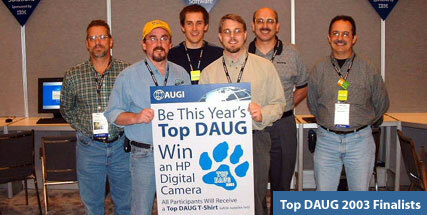 To find out more about Top Daug you will want to visit the AUGI web site.